My anxiety, actually, came from the fact that in one hour I was to be interviewed on a radio blog show. Hosted by Rob White, a New York Times bestselling author and regular contributor to the Huffington Post, we talked about my writing, my philosophy, and my psychological studies, things I am very well versed in, namely, because they’re all about me. Now even I, an acclaimed actor of the the-a-TER, was still anxious before we went live—I wanted to be entertaining, not sound like a fool (well, no more than usual). So reaching into my never-ending bag of psychophilosophy tricks, I recalled some research done by Allison Brooks on reappraising anxiety. The source was unknown for this comic but it made me smile. We’ve all been her. Talk about a load of garbage. I mean, come on, we’ve all been anxious; the last thing you feel is relaxed. Telling yourself that you are at ease, then, while you’re feeling anything but, is only going to focus you on the fact that you’re not relaxed. Allison Brooks began her experiments by telling participants that they were going to do one of these tasks and then waited for them to get nervous. Now for one group of people, she gave them no advice. In another group, she instructed them to relax. 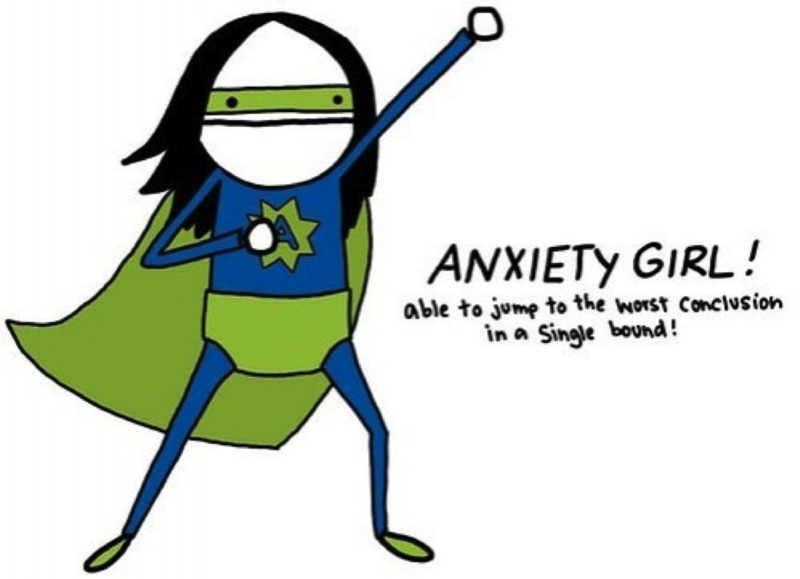 And in the third group, she told them to “reappraise” that anxiety as excitement, i.e. participants were instructed to tell themselves that the nerves they were feeling were due to their excitement to perform the task. And although there was no differences in the amount of anxiety felt (no matter which group you were in, you still felt nervous), those who were told to think of their anxiety as excitement performed much better than either of the other two conditions. So sitting in my chair at my desk, the phone to my ear, Rob White introducing me on air, I frantically worked to reappraise my anxiety as excitement. Now, how did I perform, though? Well, you’re welcome to listen to the radio blog and decide for yourself.